Articles — APTec – Allied Pipeline Technologies, Inc. The world’s resource industry has used steel pipe for fluid transportation since the turn of the century. Over the last 100 years, improvement in pipe manufacturing, pipe materials, construction methods and corrosion protection have added further reliability and extended the life of steel pipelines. It is hard to find a better material that is as strong, installation friendly, and economical. Internal corrosion protection furthered the success and life of steel pipelines for oilfield water injection and multiphase oil and wet gas flowlines. The early developments of internal coating or paint on the internal surface of the pipeline experienced limited success due to application and joint coating. In the early 1980s, there was an urgent need for a better way to protect the steel pipe from corrosion. The solution was found with the development of a polyethylene (PE) pipe being installed inside the steel pipe. This resulted in a pipe that had the strength of a welded joint (in the steel pipe) and the continuous internal lining of up to 1 km in length. Figure 2. A 36 in. liner installation. The catalyst and the push for further development of PE lining came from the technical offices of the major energy companies in Calgary, Alberta (Canada). At the time, they could see the benefits of a combined steel and PE pipe, and by the late 1980s, after trials with different methods of lining with PE, a long-term solution was found. The result was a compression fit, or tight fitting, PE pipe installed inside the steel pipe in long lengths. The design requires the PE material to be suitable for the method of installation, and diameter of the PE pipe sized larger than the inside of the steel pipe. During installation, the PE pipe is reduced in size using roller reduction equipment that is powered to reduce the pulling force and lower the stress on the PE material. These methods of installation have been enhanced over the last 30 years, and today the industries served can benefit from over 16,000 km of PE lined steel pipe. There are two key developments over the years. First, is the use of powered roller reduction equipment vs non-powered or swaging of PE pipe during installation. The second development is the evolution of superior grades of high density PE (HDPE), which are now the standard for PE lining. Figure 3. Carrying out liner operations. Allied Pipeline Technologies Ltd (APTec) is a multinational organization providing PE lining and specializing in pipeline services. The company has focused on developing and implementing solutions for corrosion and abrasion protection of new pipelines, as well as the rehabilitation of existing pipes with no-dig methods. To date, APTec has serviced and executed projects throughout the US, Canada, South America, the Middle East and Africa. Its client base includes mining companies, oil and gas industry leaders, and a variety of municipal and industrial operators. With the success of building APTec on an international scale, garnering a reputation for providing clients with consistent, cost saving, added value and protection, the company has emerged as an industry leader of corrosion protection, focusing on the safety and integrity of pipeline infrastructure. In 1988, Dale Kneller, a Founder of APTec, invented and patented a method of roll down tight fit lining of steel pipe, and this method – along with enhancements – is the mainstay of the tight fit PE internal lining used for the past 25 plus years. Kneller’s combination of technical development skills and management experience links the history of this specialty pipeline business with the future needs of APTec’s customers. The owners and employees of APTec are committed to providing their customers with a solution to protect and enhance the value of their pipeline assets. Protecting the environment is a major concern within the oil and gas industry. Since the invention of pipelines, there has been a constant effort to mitigate and eliminate the risk of pipeline spills, exposure, and failures. For example, in Alberta there has been a reduction in pipeline incidents by 44%, from 2007 - 2016. More broadly, the most recent national tallies of environmental protection expenditures found that the Canadian oil and gas industry spent more on environmental protection than any other industry surveyed, reporting over half a billion dollars in expenditures each for site reclamation and decommissioning, as well as for pollution prevention processes. In this vein, HDPE into steel pipelines is a service that was developed over 25 years ago to provide internal corrosion protection. Improvements like these have been a catalyst to the expectation to continually develop, innovate and enhance products and services that can prevent incidents and protect the environment. Figure 4. A 4 in. steel pipeline being lined in a cold Canadian winter. Public scrutiny of pipelines and a very small window of tolerance in terms of accidents produce the drive to not only advance operations, but maintain these systems as well. Whether it be extending the life and integrity of an existing pipeline, or servicing lines with sour gas, water-cut oil, salt water or high pressure with corrosive capabilities, APTec can find solutions and work with any company to tackle these projects. APTec supplies and installs the tight fit HDPE SURE-Liner system for high or low pressure applications and for all types of service (H2S, injection, emulsion, tailings, slurry, dry/wet gas, fresh/salt water etc.). PE is rust-proof, flexible, abrasion resistant, corrosion- free and can withstand harsh chemical environments. Installations have long-term cost advantages due to its physical properties, leak-free joints and reduced maintenance costs. Life of HDPE is up to 50 years in water service. Increased flow of materials being transported is seen from the coefficient friction loss gained from the smoothness of HDPE vs steel pipe. Liner installations use a trenchless method technology that creates minimal ground disturbance, saving time and money along with being ecologically sensitive. Venting and monitoring system allows for leak detection, allowing the steel to uphold its secondary containment properties. If we examine pipelines through or near water sources, such as rivers, creeks, and lakes, any damage to ecological habitats and the water itself can have lasting consequences. Mitigating the risk around ecological or residential areas is a proactive measure that can enhance the value of your operations. The usage and implementation of liners can provide a secondary containment system, in conjunction with the ability of APTec finding solutions and alternatives, such as pulling standalone products and composites as an alternative to a tight fit liner system for all your corrosion protection needs. This environmentally and economically conscious approach has been instrumental in protecting aging infrastructure and is in ever-growing demand and popularity amongst oil and gas producers. Figure 5. HDPE lined up and ready for installation in Chile. Within the oil and gas industry, composites in pipe applications are expected to remain the largest market by value and product consumption. North America is expected to remain the largest market due to growth in natural gas infrastructure projects, and awareness of the advantages of composite materials for oil and gas over traditional materials. This, coupled with the ever growing demand for oil and gas that is not going anywhere anytime soon, creates a robust and high demand marketplace moving forward. By 2040, the world will need 32% more energy than is currently being produced. It is also understood and proven that pipelines are the safest and most economical and efficient means of transporting the world’s most consumed natural resource. APTec has provided pipeline solutions on a worldwide scale to the oil and gas industry. There are a number of methods to recovering oil and gas, and these can produce specific, yet similar, effects to the corrosion of pipelines internally. Three specific methods include primary, secondary, and tertiary recovery methods. Primary recovery is when oil is recovered as a result of expansion of reservoir fluids, which are naturally pressured within the producing formation. Secondary recovery involves techniques in which external fluids (highly corrosive) are injected into a reservoir to increase the pressure and production. Tertiary recovery seeks to alter the properties of the oil in ways that facilitate additional production. This can be seen from chemical flooding and miscible displacement involving carbon dioxide (CO2), hydrocarbon and nitrogen injection. All three can produce chemical properties that can internally corrode and degrade the integrity and wall thickness of a steel pipeline. Other services, such as sour gas, salt water, and water cut oil, can be highly detrimental to pipelines if not monitored or protected properly, and these are common applications that are benefiting from liner technology to date. The SURE-Liner system is an internal pipe lining process that involves the insertion of a tight fit HDPE plastic liner pipe inside the steel pipe, thereby taking advantage of the mechanical strength of the steel pipe with the combined corrosion and abrasion protection of the liner. The HDPE liner pipe is manufactured to ASTM and ISO industry standards for PE4710 and PE100. To obtain a tight fit, SURE-Liner pipe is sized larger in diameter than the inside diameter of the steel pipeline, and is radially compressed (rolled down) during the insertion process. The liner is simultaneously pulled by one of the company’s winches or wireline units and pushed through the Powered Roller Reduction Box with its hydraulic capabilities, ensuring a seamless insertion process. The SURE-Liner pipe then returns to its original shape to create the tight fit liner system. The newest generation of powered roller reduction equipment has provided APTec with more pushing power, longer pull lengths, fewer bell holes and connections, and – most importantly – less stress on the pipe during the insertion process. The length of pulls depends on the size of pipe, topography, bends and condition of the host pipe. A standard flange connection has been a staple for the liner business throughout its existence. However, for higher pressure and temperature applications, APTec has developed the most advanced flange connection using the internal pressure of a double O-ring, creating a dynamic seal to satisfy unconventional pipeline needs. When it comes to pipeline infrastructure, let Allied Pipeline Technologies build it safe and make it last! At Allied Pipeline Technologies (APTec), we strive to keep the oil industry safe for humans and the environment. As the industry grows and changes, this goal becomes increasingly important. For instance, public scrutiny of pipelines and a very small window of tolerance in terms of incidents produce the drive to not only advance operations but maintain the industry’s infrastructure. If we examine pipelines through or near water sources such as rivers, creeks and lakes, any damage to ecological habitats and the water itself can have lasting consequences. This is just one of numerous areas where the usage and implementation of liners can provide a secondary containment system. Yet, the ever-growing demand for oil and gas is a reality, and this is not going anywhere anytime soon. By 2040, the world will need 32 percent more energy than is currently being produced (International Energy Agency, 2015). Increased oil production – particularly within the Canadian oil sands – will address this need (National Energy Board, 2016). It is also understood that pipelines are the safest, most efficient, and most reliable method of transporting the world’s most consumed natural resource (Natural Resources Canada, 2016). For these reasons, when it comes to pipeline infrastructure, let’s continue this trend. Build it safe and make it last. Efforts to mitigate the risk of pipeline spills, exposure, and failure are an ongoing practice within the oil industry. In Alberta, such efforts have seen a 44 percent reduction in pipeline incidents over the last ten years (Alberta Energy Regulator, 2017). The service of pulling liners or high-density polyethylene into steel pipelines to provide internal corrosion protection was developed over 25 years ago. Such advancements mean there is a continued expectation to develop innovative technology that can prevent incidents and protect the environment. APTec is at the forefront of these advancements. As a worldwide, specialized pipeline contractor, APTec installs products and provides services of the highest quality, integrity and reputation that will enhance the value of your operations. Our team can support the ever-improving stability of pipeline safety in your organization. APTec has grown to over 300 employees and completed projects throughout North America, South America, and the Middle East. We pride ourselves on working with companies and individuals to implement solutions for protecting new pipelines against corrosion and abrasion or extending and rehabilitating existing pipelines. If you would like to learn more about how APTec’s capabilities can serve your organization, please contact us through our website, or feel free to contact a team member directly via LinkedIn. Alberta Energy Regulator (2017). Pipeline performance in Alberta. International Energy Agency (2015). World Energy Outlook 2015. National Energy Board (2016). Canada’s energy future 2016: Energy supply and demand projections to 2040. Natural Resources Canada (2016). Key facts on Canada’s pipelines. The emphasis and concern on the safety of pipelines and their environmental impact and exposure today is considerable. The recent publication of the AER initiative towards better performance, pipeline integrity, and monitoring has made this even more prevalent and transparent especially to the public. Allied Pipeline Technologies focus is developing and implementing solutions for corrosion/abrasion protection of your new pipeline, and rehabilitation of existing pipeline with no-dig methods. The secondary containment system and best practices defense against internal corrosion will bring forward significant value to new and existing infrastructure. Whether it be extending the life and integrity to an existing pipeline or combating lines with sour gas, water-cut oil, salt water, or high-pressure with corrosive capabilities, APTec can find solutions and work with your company to tackle these projects. 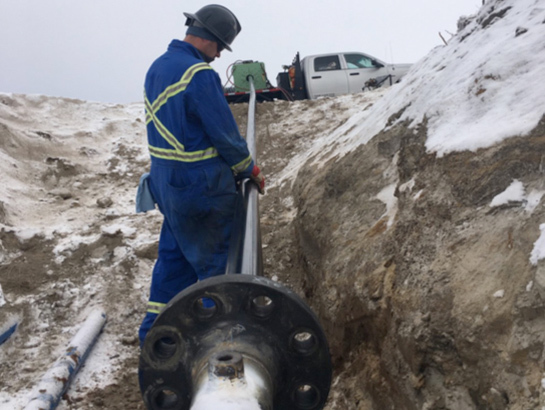 APTec Canada supplies and installs the tight fit HDPE SURE-Liner™ System for high or low pressure applications and all types of service (H2S, Injection, Emulsion, Tailings, Slurry, Dry/Wet Gas, Fresh/Salt Water, and more). APTec Canada also installs with a variety of composite products to be installed as Slip-liners for applications that cannot rely on the host line for integrity. The new system implemented through the acquisition of Aztec Liner Systems by APTec Canada is called the “SURE-Liner™ System” used to obtain a tight fit installation. This system is highly innovative, and has operational improvements over other liner technology in the marketplace today. The combination of the two organizations has brought a wealth of expertise, technology, and innovative refinements to a proven and industry leading process. SURE™-Liner pipe is sized larger in diameter than the inside diameter of the steel pipeline and is radially compressed (rolled down) during the insertion process. In order to obtain a tight-fit liner APTec Canada has refined the Powered Roller Box – the newest generation of power roller reduction equipment. The power and design of the roller reduction results in more pushing power, longer pull lengths, fewer connections, and most importantly less stress on the liner pipe during installation. Moving towards spring break-up we welcome the opportunity to meet and discuss your pipeline protection or rehabilitation needs and work towards defending your pipeline assets and keeping your revenue streams flowing.